The K75 was introduced in 1985 sporting a 3-cylinder engine with a balance shaft and shaft rear drive.. It was produced until 1995. The drivetrain was consistent (with minor upgrades) through the production run with Bosch LE-Jetronic analog fuel injection and an engine rated at 68hp and a 4.7 second 0-60 time. There were five basic variants, the US-only naked K75T, the bikini-faired K75C, the sport faired K75S, the naked K75 standard, and the fully-faired K75 RT. 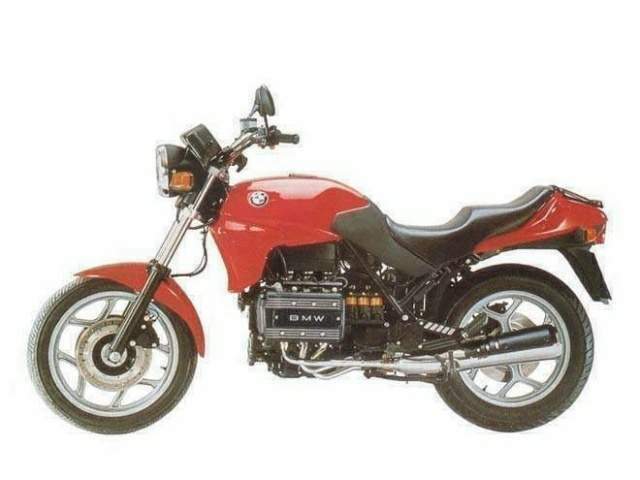 When designing the K100, BMW decided to expand the K series with a smaller bike. Although the flat twins should be continued with up to 800cc, it seemed enticing to use the new design, which had been involving both expense and time, for several engine variations. Because BMW expected problems to make the flat twins suitable for the noise and emission regulations of the future and to increase the engine power, they decided that the K engine was the first choice. As mentioned in the K100 chapter, they planned to build an inline four with 1300 cc and a 1000cc triple. Soon the engineers realized that the engines would have been to long and heavy, so they developed smaller ones. Interesting: they had been thinking of a four cylinder engine instead, but that one had been as big and heavy as the “big block”. Worst of all, it would have been nearly as expensive. For that reason, they made the decision to shorten the “K4”, what was the early code for the four cylinder, by one unit (“K3”). Many parts could be used for both variations. Nevertheless, assuming that it takes only a metal saw to cut one cylinder is false. Beside all similarities, both engines had very special problems. The vibration of the four cylinder causes the “pins and needles” feeling, but the triple has strong vibrations, caused by mass moments. This is why the take-off shaft, which is located underneath the crankshaft, has been equipped with two counterweights in case of the K75. By the way, the shaft (and, of course, the clutch) of any K bike is rotating in opposite direction so that accelerating produces no tilting moment. The jolt damper, which is part of the clutch, caused further problems: its rubber elements could not stand the vibrational stress. At least, the modified dry clutch of the R80 model appeared to be reliable. There were other modifications necessary to earn the desired power of 75hp. Remember that the power per 1000cc had to be increased by 10% compared to the K100. This has been possible mainly by a modified combustion chamber with higher compression. Compressing 11:1, premium fuel is required for any K75. But, due to the development which took two more years, the fuel may be unleaded -early K100 require leaded fuel. Today, we wonder if the issue of the K75 has been delayed until 1985 for technical or commercial reasons. In fact, some problems of early K100 models never appeared at the K75. Notable are the results of the shorter and lighter (by 10 kg) engine. The increased handiness is one thing, on the other hand the bike was less stable due to the lower weight on the front wheel. 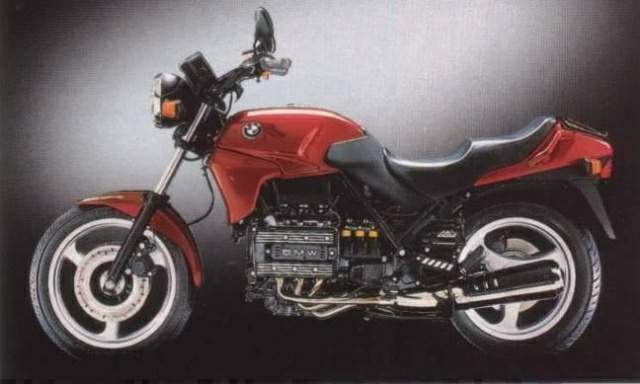 Reacting on motorcycle magazine's tests, BMW retrofitted the K75 in January, 1986 with a “fluid block” inside the steering head to absorb the kickback effect by friction -but which caused the bike to be less handy. This leads us to frame and suspension. The frame differs from the similar K100 part by flattened front tubes. The front fork was fitted with a brace that was included in the front fender. In August, 1985, two models were presented: the K75 C with a cockpit fairing which was fitted to the handlebar, rear drum brake and an 18 inch rear wheel as a standard version. Plus, for those who prefer sports bikes, the 75 S with a slim appearing half-size fairing, mounted to the frame. In this case, the 17 inch rear wheel with disc brake was standard, as used at the K100. Although the spring deflection at the “S” rear was the same as in case of the “C”, the spring was more progressive to match with sportive riding. On front, the spring deflection of the K75 S was reduced to 135mm (K75 C: 185mm). The K75 S suspension was available as a sports kit for the K100, too. After being on the market for one year, the K75 line was supplemented by the naked K75. Being quite similar to the K75 C, this model costs 11,990 DM (EUR 6130) and is the cheapest K ever. Thus, buyer´s interest for the K75 C weakens rapidly. It was not surprising that the naked K75 superseded the C in 1990. In 1989, the K75 RT was presented as the fourth and most successful triple. The outfit was similar to the K100 RT, so the K75 line was completed with a comfortable touring bike. The RT was not only a popular private bike. As an official version with special equipment, it has been seen at state visits, for emergency purposes and as service bikes. Even if used professionally, the RT was strong and reliable. Even the fact that most modifications which had been made to the 1000cc bikes hasn't been made to the 750s did not change its popularity: the four valve technology, the three-way catalytic converter or the Paralever have never been used for the K75. In foreign countries, the success of the K75 was much bigger than in Germany. It´s not true that the prophet had no honour in his own country, but the difference between 750 and 1000cc is less important in countries which have speed regulations. For that reason, less than one fifth of 67.964 K75 ever built remained in Germany. Spain, France and the United States were the main export countries for the K75. With a total of 11 years, the K75 remained longer on the market than the 1000cc bikes. As a last edition, BMW presented the “Ultima” series of K75 and RT in 1996. The basic type was equipped with a cobalt blue painting with silver lining, three-spoke-wheels (K100 RS 16 look alike, but with smaller dimensions), wind shield, wider handle bar with heat grips, ABS, catalytic converter, hard bag mountings and luggage rack. This results in an extraordinary price of 19,950 DM (EUR 10,200), making it unbelievable that this was the cheapest K once upon a time. A brand new R1100 R was available for the same price ! The K75 RT Ultima required another 4000 DM (EUR 2045), including the same features and even the electric windscreen as used on the K1100 LT. By the way: the Ultima bikes had only 68hp, seven less than in the beginning of it´s career. Until the end, a modification was available (400 DM / 205 EUR) to reduce the power output to 50hp. 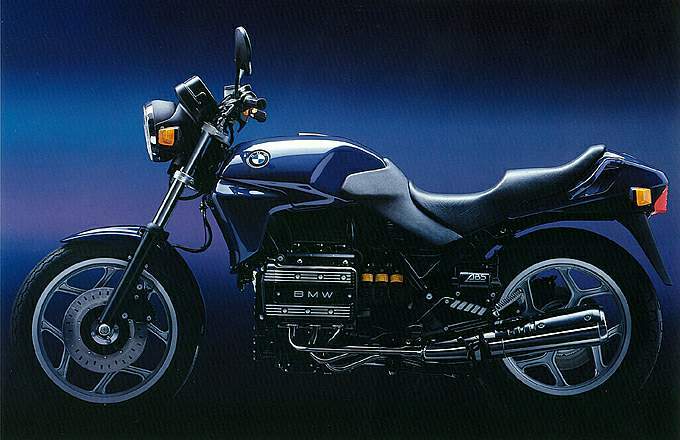 Since 1996, BMW never produced triples again.